New T-Shirts in Store at the Cabin! 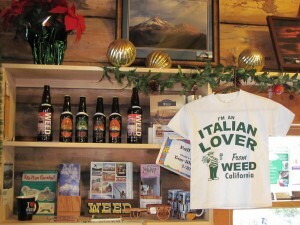 The town of Weed is well known for our world famous T-shirts…. which make for excellent Christmas gifts! At the Visitor’s Cabin we have all sorts of gifts available; local art prints, mugs, frisbees, cozies, hats, books, magnets, postcards, and more! Everything is priced to sell so come on in, shop local and support the Weed Chamber of Commerce! I am looking for the t-shirts and sweatshirts that were sold in the truck stop across the freeway from the town of Weed. I would like to purchase more if they are still available through your gift shop. We get our gift products from the Weed Store at http://www.weedstore.com. They have the t-shirts, sweatshirts and so much more!